The proprietor of Joseph Klein, Clothing, at 110-118 Stanton St., New York, was Joseph M. Klein (1882-1961). Joseph M. Klein was an immigrant from Austria/Russia (Galicia) in 1898, and he appears in Trow's New York City Directory of 1907 as "Klein Jos M clothing 157 1/2 Stanton." This entry changed to "Klein Jos M clothing 118 Stanton h 164 do" in 1917. In 1972 the entry in the Manhattan telephone directory became "Klein Joseph M Tall Men Stores Inc 118 Stanton GR 7-8787." Joseph Klein's certificate of naturalization, dated 30 April 1904, said that he lived at that time at 207 E. Broadway, that he was 27 years old, a clerk, born 27 Dec. 1882, and that he had arrived at the port of New York 11 Jan. 1898. Klein appears in the 1910 U. S. Census living at 157 1/2 Stanton St., Manhattan, Ward 17. In 1910 he was 29 years old, born Austria, immigrated 1898. He lived with his wife, Rosie, 27, born Russia, and two small children, Eva, 4, and Sidney, 2. In 1918 he registered for the World War I draft, when he lived at 163 Norfolk St., and when he declared that he was a naturalized citizen, 37 years old, born 27 Dec. 1880. In the 1920 U. S. Census Klein, now age 38, lived at 165 Norfolk St. His wife, Rose, was now 36 and their children were Evelin, 14, Sidney, 11, and Morton, 4. By 1930 the Kleins had moved to 1660 Carroll St., Brooklyn. Their daughter, Evelyn, now 24 years old, worked as a bookkeeper in a clothing store, and their eldest son, Sidney, 21, worked as a salesman in a clothing store. Very likely the clothing store was their father's business on Stanton St. Klein also registered for the World War II draft in 1942. At that time he was 59 years old, and lived at 1745 President St., Brooklyn. 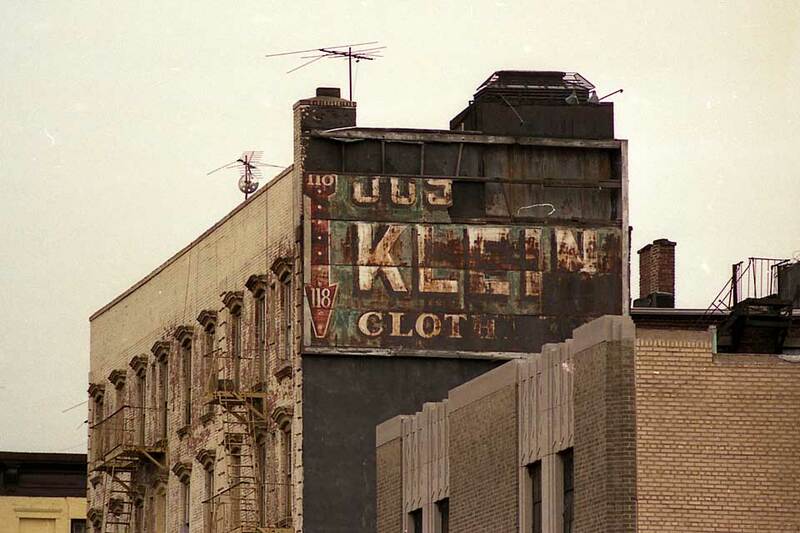 Klein died in 1961 when the following appeared in the New York Times, 29 Oct 1961, "Joseph M. Klein, president of the retail men's clothing corporation of his name at 118 Stanton Street, and of the Tall Men's Stores of Newark, and Hempstead, L. I., died Wednesday, apparently of a heart attack, in his home at 1745 President Street, Brooklyn. His age was 78. Surviving are two sons, Sidney and Morton; a daughter, Mrs. Evelyn Leibowitz; a brother, a sister & six grandchildren." The business remained at 110-118 Stanton St. from 1917 to 1990.